4:40 AM is not a very friendly time for check-in desks to open at London’s Heathrow airport. I started investigating my travel options and discovered, according to one friendly parking service lady, that “they” had only recently begun opening check-in desks before 5:00 AM and that, consequently, their regular shuttle bus services and didn’t begin before 5:00 AM. Neither did the “meet and greet” services, effectively valet parking where one drives to the terminal and is met by a man who zooms off to undeclared destinations with ones car, begin until 5:00 AM. So, we seem to have adjusted early morning flight times without adjusting the support services. Sound familiar? Regular long-term parking still works but you have to summon the bus rather than having a regular circuit being performed. We opted for a taxi, which was to be £65.00 plus, of course, a decent tip for the poor sleep-deprived driver. 3:30 AM is not a very friendly time for a taxi to come calling. [Ed: it’s about an hour’s ride from home to Heathrow, to be safe.] An hour or so earlier and it would be worth toughing it out by staying up and not bothering with bed. Naturally, going to bed early doesn’t work ‘cos you just lie there awake until you’d normally have hit the sack. So, bed it was with our beauty sleep rudely curtailed at 2:40 AM by a very gentle alarm courtesy of Nokia. … and, sure enough, our sleep-deprived driver arrived on the dot of 3:30 AM to collect his two sleep-deprived but excited passengers, one of whom almost left his bag in the porch, complete with dancing shoes. Dancing shoes? Yes, well, Carol did say we were off to Madeira to do the levadas. 😯 Dreadful Portuguese puns aside, mercifully the driver was awake enough to notice and retrieved my bag for me. With Heathrow just beginning to wake-up, check-in was a breeze. Luck continued when we were handed an exit row and, with the TAP plane only about 50% full, we had a very comfortable 3hr 15min flight to Funchal, Madeira, where we were greeted by Donal, our tour leader, and sunshine. 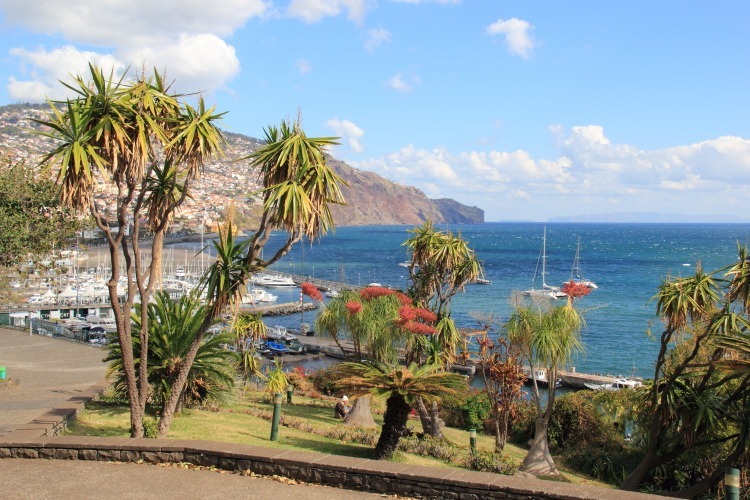 Funchal is pretty much an amphitheatre of buildings clinging to a steep, curved mountainside surrounding a harbour where cruise ships frequently call. 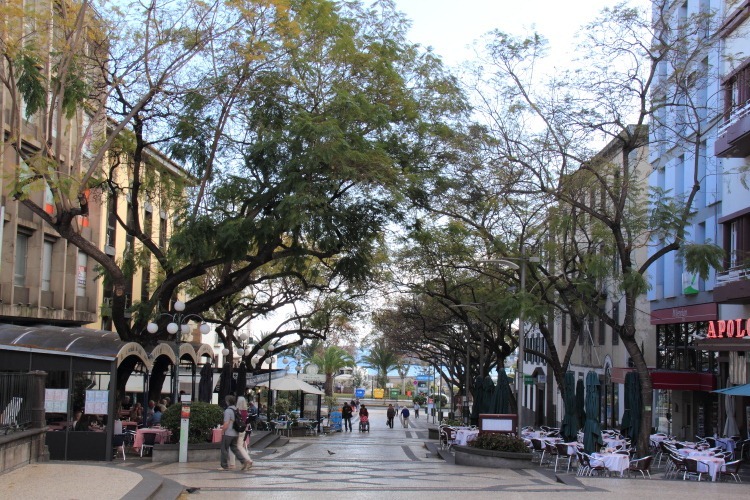 Actually, Madeira being little more than a 50-mile wide collection of volcanic mountains, all it’s settlements are really amphitheatres of buildings clinging to steep mountainsides. Madeira is on the same time zone as the UK [Ed: sensible people.] so we were settled in our hotel room by 11:30 AM in plenty of time to try something local for lunch. 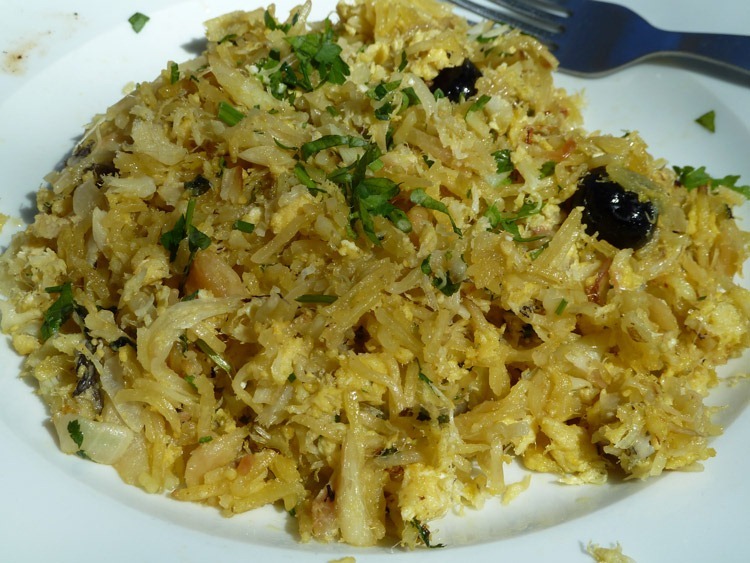 We found an appealing restaurant with street tables and I couldn’t resist what is apparently a popular Portuguese rendition of salt cod called Bacalhau a Brás. 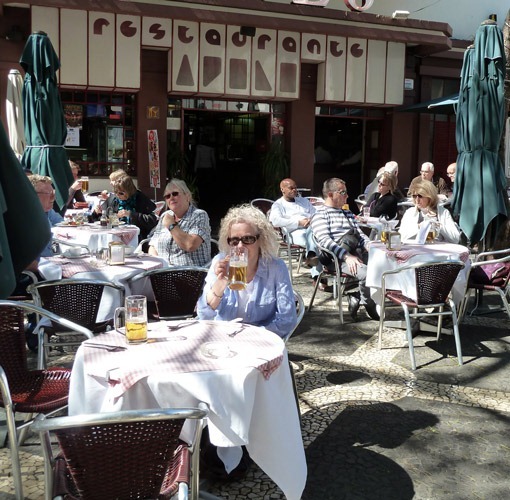 Not being keen on salt cod, Carol chose some very tasty grilled squid and, since the home team had named their beer Coral, Carol also fancied a glass with her name on it, albeit misspelled. I kept her company. Well, you can’t let a lady drink alone. And very good it all was, too. You may notice the patterning on the street in the above picture. 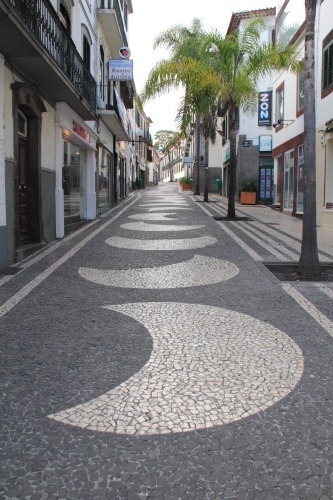 Most of the streets and paths/sidewalks in Funchal sport patterns made from a mosaic of black and white tile pieces. As far as I could tell, the pattern in each street was also unique. Laying the mosaics must have been very painstaking work but it was well worth it and makes for an attractive finish. Being a quiet Sunday, I managed a snag a sample picture of one of the more ornate side streets, unimpeded by pedestrians or cars attempting to flatten tourists standing in the middle of the road and armed with snappy cameras. An enjoyable if painfully early start. The walking begins tomorrow.